CHANDIGARH has almost completed 50 years of existence and during this period it has grown faster than ever anticipated. It would be of interest to recount some of the events that contributed to the building of this magnificent city. Despite the late start of the new capital for East Punjab that was necessitated due to the transfer of Lahore to Pakistan, hopes were kindled by the thought of a brand new city that would surpass the glory of Lahore  considered the Paris of India before the Partition. In May, 1950, the US team of Alber Mayer, an eminent town-planner, and bright young architect Matthew Nowicki arrived in Shimla and without much ado started working in one room of the Punjab Civil Secretariat (Elerslie) that was furnished only by drafting tables and stools. I was assigned to assist Nowicki. In August, 1950, Nowicki died in an air-crash near Egypt, putting an end to the work initiated by the US team. The Punjab Government lost no time in despatching P.N. Thapar, an astute administrator, and P.L. Varma, Chief Engineer, for the selection of a new team to Europe. In London, E. Maxwell Fry and his partner and wife, Jane B. Drew, accepted the assignment and suggested the name of Le-Corbusier for the most prestigious task of designing the capital city. Le Corbusier was widely known for his revolutionary ideas and was striving hard to demonstrate his theories for the future cities and reconstruction of the war-torn Europe. Le Corbusier was accompanied by his longtime associate and cousin P. Jeanneret when the new team of architects assembled at the P.W.D. Rest House near Pinjore Gardens. The name of Chandigarh was later adopted for the new capital city. Le Corbusiers first meeting with Jawaharlal Nehru got him instant recognition and patronage at the highest level. Le Corbusiers major assignment was to prepare the Master-Plan and design the Capital Complex at the city containing High Court, Secretariat, Legislative Assembly and Governors Palace. He also designed the Museum of Art and Arts College in Sector-10, and Sukhna Lake with the Lake Club. Le Corbusier laid down major guidelines and architectural controls for the city as well as the 16-km Periphery Control Act. This Act was considered most essential to save the region surrounding the city from exploitation. Le Corbusier laid special emphasis and formulated guidelines for the landscaping of the city which Dr M.S. Randhawa painstakingly implemented. 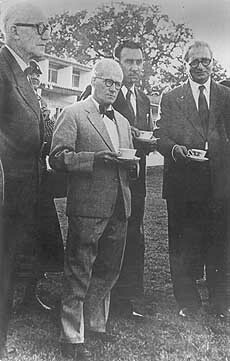 Le Corbusier visited Chandigarh twice a year mostly in April and November to oversee his works. Le Corbusier was highly organised in his work-schedule and had to work very hard to meet his commitments. Many times, he compared himself to a donkey  the beast of burden. Le Corbusier was not unaware of his greatness and never uttered a word or drew a line without a deep meaning or significance. At the same time, he was most considerate and displayed great sense of humour at work sessions. In appreciation of hard work done by Indian architects, Le Corbusier presented them with his valuable sketches and paintings. Fry, Drew and Jeanneret got fervently busy, assisted by the Indian team, with the detailing of sectors and the designs for all categories of government buildings, including housing, hospitals, educational and commercial buildings, to make the city viable in time for its inauguration in a period of three years. It was a treat to watch these architects at work  producing designs at a record speed as if they were flowing out of fountain-heads. P.N. Thapar was a remarkable coordinator and kept a hawks eye on every aspect of the project. Every effort was made to provide basic infrastructure and accommodation, even on a temporary basis to start the functioning of government by the time Chandigarh was inaugurated by Dr Rajendra Prasad in 1954. It was very sad to see Fry and Drew leave soon after the inauguration having completed their three-year term, but they never lost the contact. Le Corbusier and Jeanneret, assisted by an Indian team, continued to work for the completion of the capitol complex and earlier phases of Chandigarh. No aspect for the orderly growth of Chandigarh was overlooked and its fame spread faster than its growth. Newspapers and architectural journals all over the world were displaying amazing photographs of Chandigarh. most heads of states and dignitaries, including those responsible for the new capital cities like Brazilia, Islamabad, Dadoma and Abuja, visited Chandigarh to see its progress and exchange notes. In fact, Chandigarh became the Mecca for architects, planners and the art-world. Le Corbusiers buildings were highly imaginative and sculpturous, portraying dignity, power and timeless quality. The functioning of the Secretariat, High Court, and the Assembly buildings were undoubtedly at the back of his mind but they were to fit in the well conceived forms that were to create drama against the backdrop of the majestic Himalayan ranges. Unfortunately, the fourth building the Governors Palace  remained unrealised. Jeanneret retired in 1965 and the same year Le Corbusier died in a swimming accident that left the world wondering about the future of Chandigarh. It was a very crucial period in Chandigarhs history when I was asked to take over as the first Indian Chief Architect of Chandigarh and the erstwhile State of Punjab to continue with the further development of Chandigarh, including the completion of Le Corbusiers unaccomplished works, it was an enormous task and a challenge that would have been impossible but for the support of my colleagues and the next team of most talented and devoted architects. The new team strove much harder not only to come up to the expectations but to go much beyond in finding new expression in architecture while meeting the needs caused by the socio-economic changes. Chandigarh got the coveted Award of the Institute of Line in Paris for creating the best environment for the common man and I was also invited by the Rockefeller Foundation in the USA and other countries to share my experiences. Chandigarh was lucky to have Dr M.S. Randhawa as the first Chief Commissioner in 1966 when the city was barely taking shape. Randhawa had no patience for file work and shunned unnecessary discussions. During his tenure, he took personal interest in the designs and completion of Rose Garden, Shanti Kunj, Leisure Valley, Museums in Sector-10, Rajendra Park, expansion of the PGI, Golf Course, fountain sculptures in Sector-17, commercial buildings along V2 roads, new types of housing and the landscaping. Randhawa also started the second phase of the city to meet the growing needs of the residential plots. Confronted with the large-scale developments close to Chandigarh and to safeguard the future of the region, the Government of India was approached to form a high-level coordination committee comprising representatives of the concerned states and the Central Government . This committee served a very useful purpose in coordinating and assessing the needs of the region for a balanced growth in earlier years. While Chandigarh was growing at a much faster pace than ever anticipated, the attention was drawn towards the completion of the capitol complex. The then Prime Minister, Indira Gandhi, took personal interest in the orderly growth of the city and directed the implementation of remaining structures symbolising Le Corbusiers philosophy and the major fourth monumental building housing Museum of Knowledge in a phased manner. Much was accomplished, including the installation of the Open Hand monument, but during the course of time, the momentum was lost and the copitol complex remains incomplete and desolate to this date. I left in 1979 after putting in 30 years for Chandigarh to be the Adviser for the new/Federal capital of Nigeria. But, Chandigarh remained upper most in my mind. Chandigarh is the legacy of the great stalwarts of the state in their resolve to make the city worthy of pride and stands as testimony to the lofty vision of Jawaharlal Nehru  the father of modern India  and Le Corbusier the greatest architect of the century.